Like many of you, I was given beauty products as Christmas gifts. Luckily for me, the people who bought them know my taste and so there’s nothing that I don’t love. 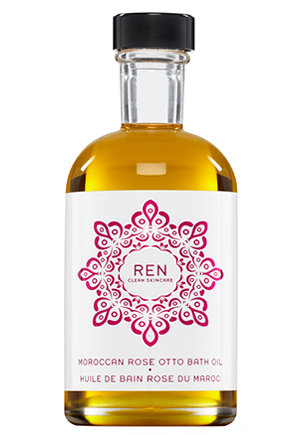 REN Rose Otto bath oil tops my list of the best beauty gifts ever. (Thank you to my lovely boyfriend!) The smell is incredible, and because it’s an oil, it moisturises so well that there’s no need for any additional post-bath moisturiser. REN make wonderful products, without many of the nasties such as parabens, sulfates or mineral oils. The base oil for this product is sesame, and the fragrance is based on the Rose Otto and Palmarosa oils it contains. I’ve been feeling ill for a week now, and bathing in this oil has helped relax and soothe my poor body like nothing else. The bottle is glass, so can be recycled, although I tend to keep mine and reuse them as tiny posy vases. As you might imagine, I’ve been using this oil quite a lot since Christmas. In fact, I’m about a third of the way down the bottle already. Many Christmas beauty and fragrance gifts will now be still unopened, as people wait for special occasions to use them. My advice to you? Open the packaging and use the products. Be lavish! My mother is notorious for keeping special beauty and fragrance products for ‘best’ – and so many times the products have spoiled before she’s even had the chance to use them. Shelf lives for ingredients are not indefinite, especially when it comes to natural ingredients like essential oils. They need to be stored appropriately and used within a certain time. Love REN skincare but haven’t tried any of the bath or body stuff yet – this sounds lovely! I love REN too and this is definitely my favourite product, I’m sure you’d love it!